In pursuit of a slim, tight and beautiful body you should not forget about your arms. The skin on your arms can lose elasticity and they can look flabby and spoil the general impression of your figure. The most effective exercises for the arms are performed with dumbbells. 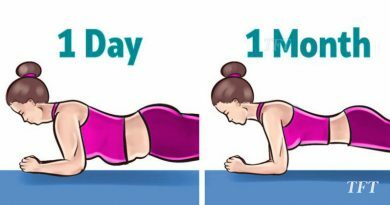 They can be done not only at the gym but at home. It is recommended that you buy dumbbells of different weights so that you can gradually increase your load. There is only one rule for an effective training program at home: you should do all the exercises in the technically correct way. 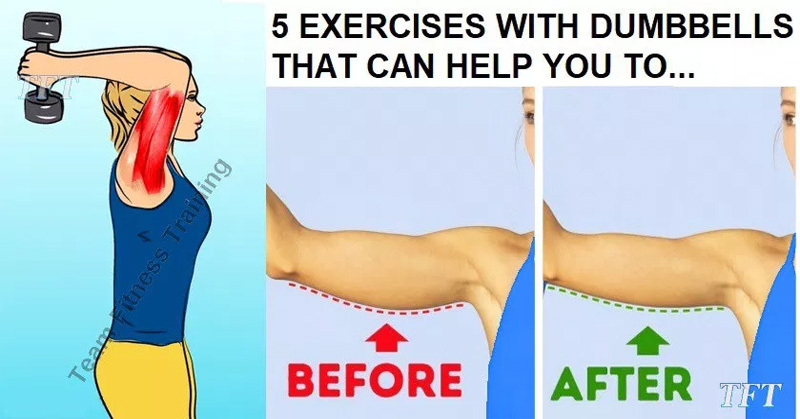 If you do these effective exercises on a regular basis, you will tone your arms very quickly. – The resistance should be resting in the palms of your hands with your thumbs around it. The palm of the hands should be facing up towards the ceiling. This will be your starting position. – Keeping your upper arms close to your head with elbows in and perpendicular to the floor, lower the resistance in a semicircular motion behind your head until your forearms touch your biceps. -Keeping your upper arms close to your head with elbows in and perpendicular to the floor, lower the resistance in a semicircular motion behind your head until your forearms touch your biceps. Tip: The upper arms should remain stationary and only the forearms should move. Breathe in as you perform this step. Grab a pair of 5lb-15lb dumbbells. Set your feet under your hips with a slight bend in the knees. Hinge from your hips and tilt chest over thighs. Bring the dumbbells up to your ribs, elbows bent and pointed straight up to the ceiling. Straighten your arm backwards, creating a straight line from shoulder to hand and recover dumbbells back into your ribs. This can be performed with both arms at once or alternating right to left. Use a pair of 3-10lb dumbbells. Set your feet in a split stance position for more body control. Raise your arms laterally to shoulder height and hold with palms facing up. Bend at elbow and curl the dumbbell towards your shoulder, then recover back out to a lateral raise. This can be performed with both arms at once or by alternating right to left. Grab a pair of 5-15lb dumbbells. Set your feet in a split stance position for more body control. Keep your arms straight in front of your body, hands resting on thighs, palms facing up. As one arm curls up to towards the shoulder, the other arm recovers straight down back to the thigh. Lock your elbows into your rib cage to prevent the upper body from swinging.